Today’s corporate planning is flawed. For example, our benchmark research finds that companies often react too slowly to changing market conditions. They miss opportunities to sell more and wind up allocating resources to less productive or less profitable activities. The key to improving planning is using approp­riate information techno­logy to support a more effective process – one that drives better busi­ness performance. A dedicated planning application has capabilities and delivers benefits that enhance the effec­tive­ness of any business plan­ning process. For instance, it can eliminate plan­ning silos and enhance collaboration because all the planning models and related data are held in a single system. 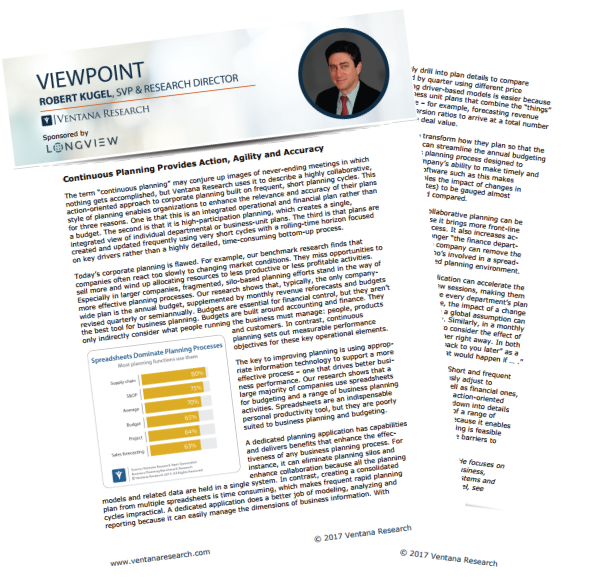 Download the "Continuous Planning Provides Action, Agility, and Accuracy" Viewpoint, and improve your business plans.